Every time we stop at the The Log Cabin Restaurant I end up hopping off of the bus (if there’s light out) and snapping a few pictures in and around the parking lot. There’s really nowhere else to go around here, and if I venture too far I risk my bus taking off without me – half-way between Tweed & Kaladar is not where I want to spend the night. Posted on Sunday, February 24th, 2008 at 10:14 pm. 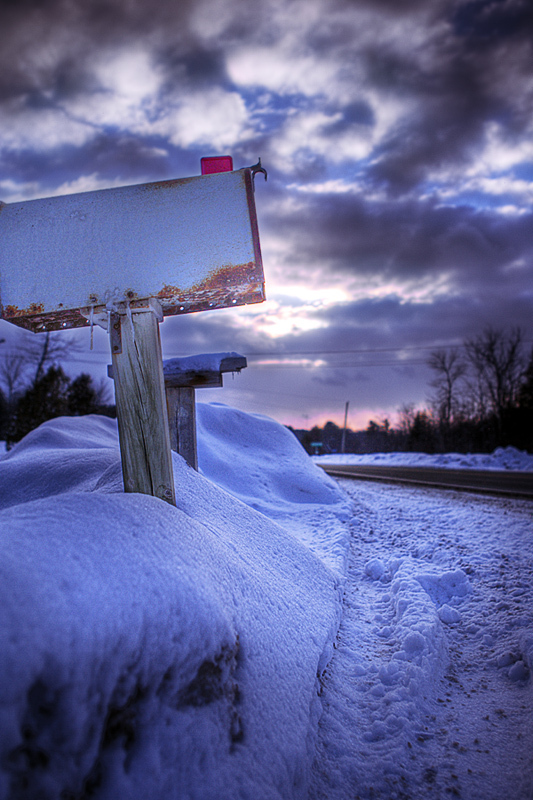 Filed under: HDR Tags: Canada, Highway_7, Mailbox, Snow, sunset	RSS 2.0 feed. The positioning of the camera couldn't have been place in a better place. I loved the way the highway is just barely visible and the clouds off in the distance, its all that's needed to give the picture nothing left to desire. However I have just one question. Was this photoshopped?